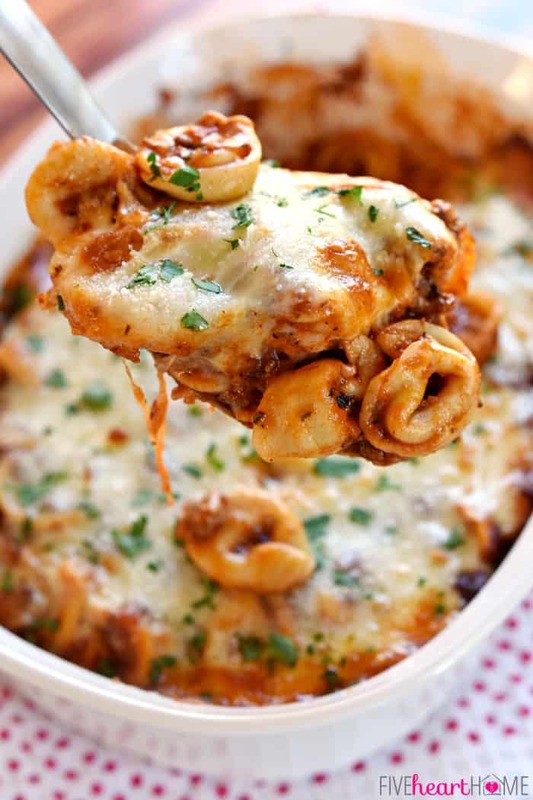 Beefy Cheesy Tortellini Bake is loaded with tortellini, marinara sauce, and mozzarella cheese for an effortless pasta dinner that the whole family will love! Nevertheless, despite being immersed in all of this great recipe inspiration, sometimes I flat-out don’t know what to make for dinner. And on those occasions, I open the freezer, stare inside, and hope that something speaks to me. This exact scenario played out a few weeks ago and, frantically flagging me down on the freezer shelf from between a bag of peas and a box of chicken breasts, was a package of cheese tortellini. And it was squawking, “Turn me into something good!” Okay, so maybe it didn’t exactly happen that way. Maybe I’m slightly hallucinogenic due to a combo of cold meds and sleep deprivation (thanks to my 2-year-old waking up about three too many times last night). Maybe the tortellini was simply sitting there, as tortellini typically does, and I randomly had the bright idea to substitute it for noodles in a spaghetti-esque pasta bake. So that’s exactly what I did. I basically made a batch of spaghetti sauce using ground beef and my favorite jarred pasta sauce, though you could certainly substitute homemade marinara if you happen to have some on hand. 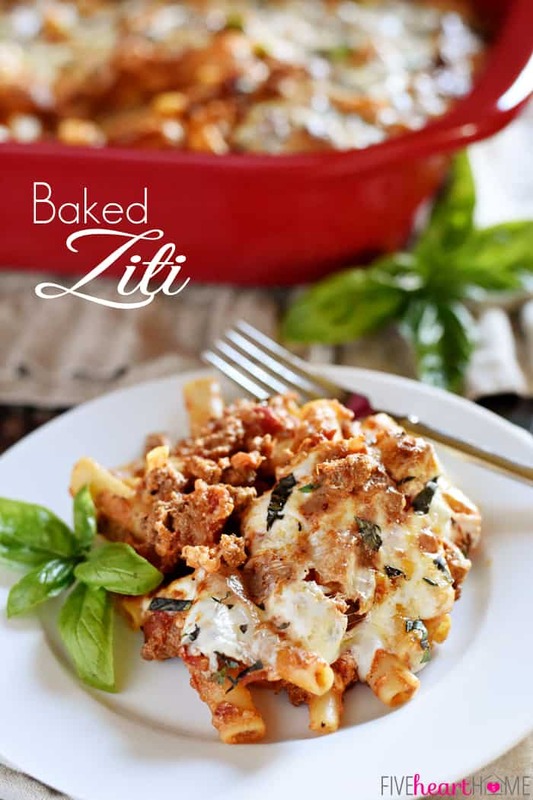 (To up the vitamin intake, I even got sneaky and added some finely grated zucchini to the meat sauce using my favorite method for hiding veggies in a recipe, but shhhh…don’t tell my kids…or my hubby)! 😉 Then I tossed in my cheese tortellini and a bit of freshly grated mozzarella, poured everything into a baking dish, topped it with more cheese, and popped it into the oven until hot and bubbly. Dinner doesn’t get much more effortless than pasta + sauce! But actually it does, because for this recipe, I didn’t even have to dirty another pot by boiling the tortellini separately. I simply ran it under some warm water in a colander before adding it to the meat sauce and then everything cooked up all together in the oven. If that’s not the definition of easy peasy, I’m not sure what is. And as a bonus, the kids loved this. 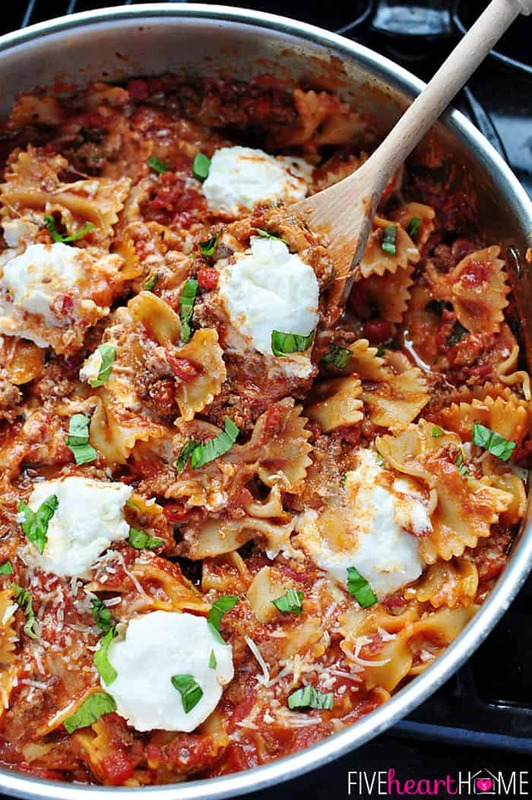 Pasta and cheese and beefy tomato sauce (and hidden veggies, to boot)…how can you go wrong?! Just because I try to cook plenty o’ things from scratch doesn’t mean that I don’t keep a few all-natural pantry and freezer staples on hand for quick dinners when I’m otherwise lacking inspiration. 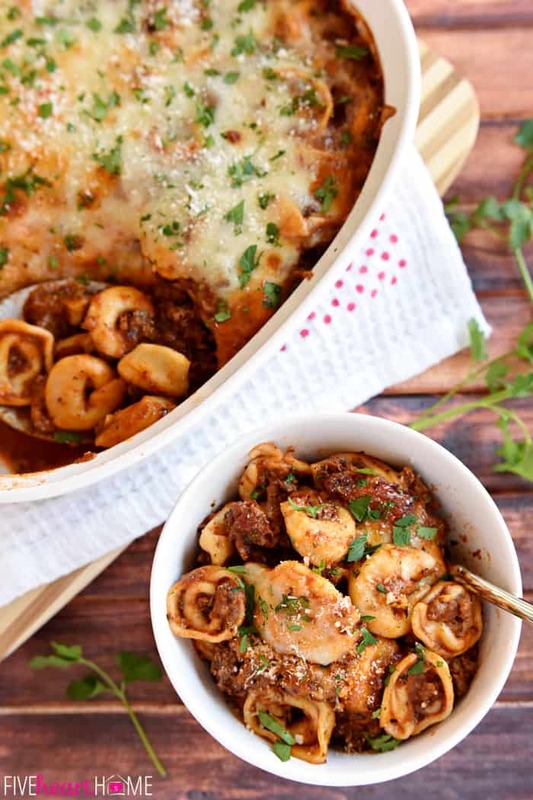 And as a result, this Beefy Cheesy Tortellini Bake is one of those perfect meals for when you’re short on time and ingredients but you still want to throw together something that everyone will enjoy. Preheat oven to 350°F. Grease a 3-quart baking dish and set aside. 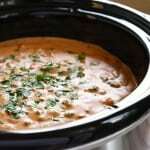 In a large pot set over medium heat, brown ground beef and garlic until meat is no longer pink, breaking it up and stirring frequently. Drain fat. Season meat with garlic powder, dried basil, dried parsley, dried oregano, dried thyme, crushed red pepper flakes (if desired), and salt and freshly ground black pepper, to taste. 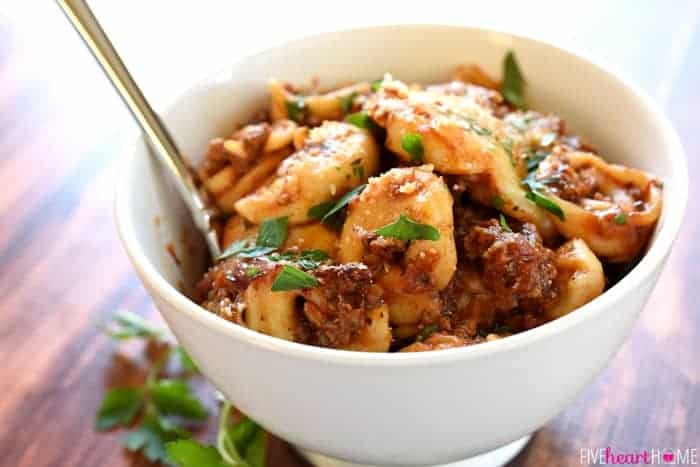 Stir pasta sauce into cooked ground beef. Pour frozen tortellini into a colander and run under warm water for a minute to slightly thaw. 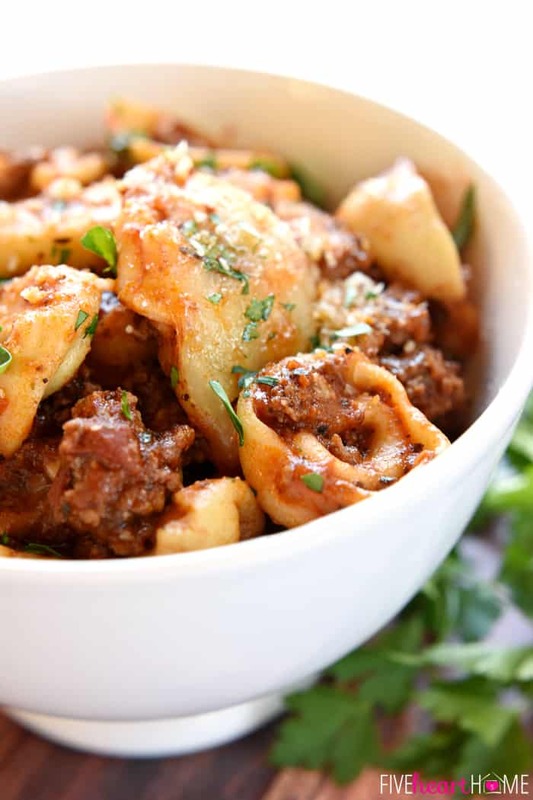 Drain and stir tortellini into meat sauce. 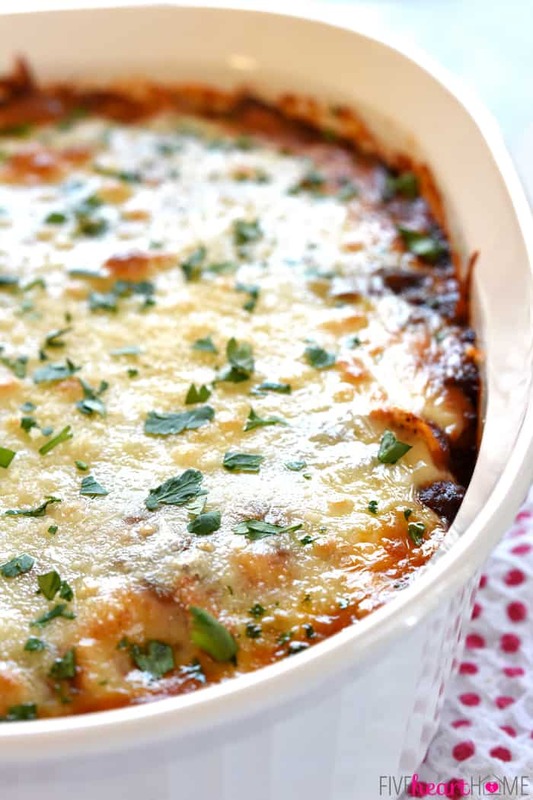 Remove pot from heat and stir in half of the grated mozzarella. 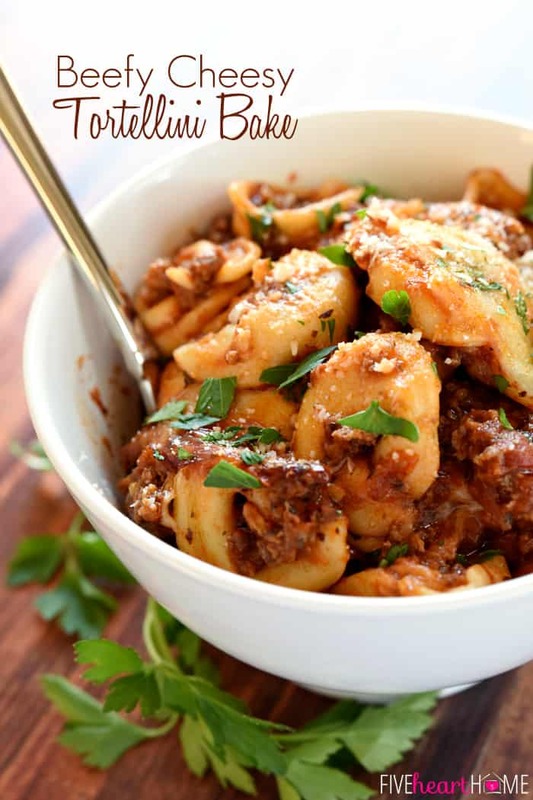 Transfer tortellini/meat sauce into the prepared baking dish. Top with remaining grated mozzarella and sprinkle with grated Parmesan. Cover with foil and bake for 20 minutes. Remove foil and bake for about 20 minutes more, or until hot and bubbly. If you have fresh herbs, feel free to substitute them for the dried herbs (and you may use two to three times the amount of fresh herbs, since fresh herbs aren't as strong as dried). If desired, you can add some grated veggies to the meat sauce using this method. Post originally published on February 15, 2015. My family will love this. I will remember your tip to not pre-cook frozen tortellini– great tip! I usually have some cooked ground beef or chicken in the freezer, just for such occasions. Can see a dinner materializing out of “nowhere”. I will go jot it down in my menu plan. You know, Mila, frozen tortellini probably still needs to be pre-cooked for food safety reasons in certain other recipes (I think it’s supposed to reach an internal temp of 165°F). But in this recipe, after being pre-thawed under running water and then baked for 40 minutes in the oven, it should be good to go. 🙂 Hope your family enjoys this when you try it! Based on this post, it sounds like I need to follow in your footsteps and create a menu plan of my own — ha. 😉 Happy Monday! Oh my goodness. This looks amaaaaaazing! I love tortellini. And beef. And cheese. Pinning! Thanks so much, Meaghan, for the comment and the pin! These are a few of my favorite things as well… 😉 Enjoy! Yes, Kristin! New but familiar seems to go over well with my family, too. 🙂 Hope it’s a hit! 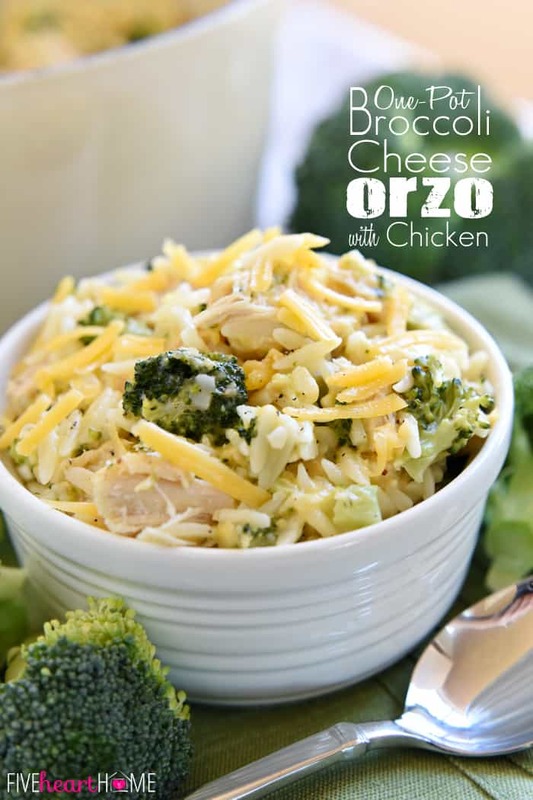 This looks really good and I know my kids would eat this up, too! Gonna try it, thanks! I hope y’all love this, Carrie! My kids scarfed it down…hope yours do the same. 😉 Thanks for stopping by…hope your week is going well! This was the perfect meal for us this week when one of my husband’s cousins showed up by surprise one afternoon. The guys especially loved the meat in the sauce. I especially enjoyed making something yummy in a flash. Thanks tons for being the inspiration I needed! You are too sweet, Carolyn! I’m so glad y’all enjoyed this, and I appreciate you stopping back by to let me know. But the question is…when are we all getting together for HH??? 😉 Happy Friday and have a great weekend! I’m always in a dinner rut! This looks amazing! Thanks for linking up with Best of the Weekend! Pinning this! Can I substitute Italian sausage for the beef? If I only have tortellini I just bought today (from refrigerator section ) do I need to cook it ahead of time or how would that work? Thanks !! 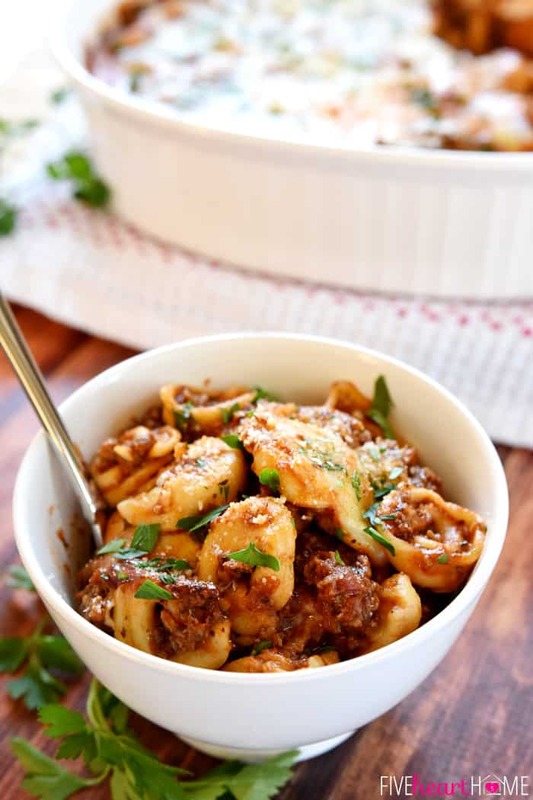 Can I use packaged (dry) tortellini in place of frozen? Such as Barilla? If so, do I need to alter the recipe any? Hi Taryn! 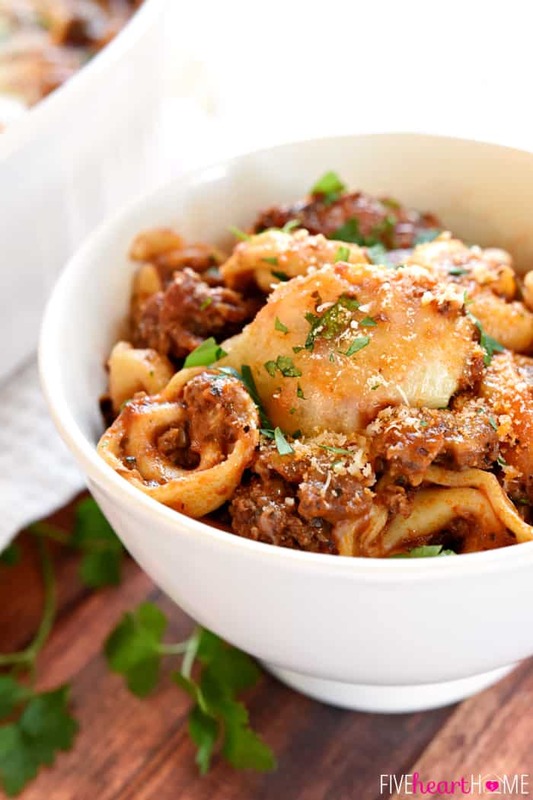 I’ve never made this recipe with dry tortellini, but it should work just fine. I’d boil it as directed until just barely al dente, and then drain it and proceed with the recipe from there. Good luck and enjoy! This was great! And easy! Even my 14 year old son made it. We will definitely be making this again. Thank you!! We just made this tonight. It’s absolutely delicious. 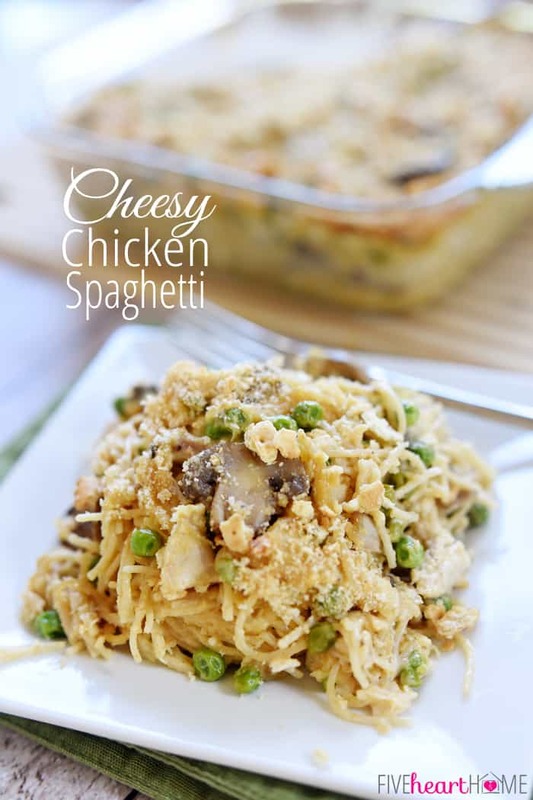 I made this for dinner last night and it was a big hit with my family! I much preferred it over the standard tortellini with spaghetti sauce. I made the recipe exactly as written and would not change a thing! Thank you for such a quick and simple meal. 🙂 Perfect for busy weeknights! The recipe calls for minced garlic and garlic powder. Do we use one or the other or both? Thanks! This looks amazing! Can I assemble ahead of time, leave in the fridge overnight and bake tomorrow? 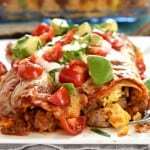 This recipe is my favorite one and this time I will try it in my kitchen also. Love this kind of easy dinner! HI Samantha! 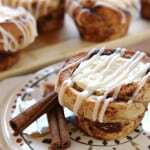 I feature a Pinterest recipe every Thursday and wanted to let you know I used this recipe this week. It was definitely a winner and will go into the dinner rotation. Of course I gave you full credit and added a link to your website and the recipe. Thanks for the post! I made this last night for myself and my 3.5 year old. It was amazing! 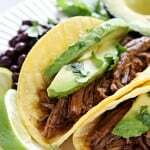 Awesome flavor and super simple and quick to throw together! thank you for making my school/work nights easier with your easy, yummy recipes! Making it as we speak. I added bell peppers, spinach, and mushrooms to the sauce. Kept everything else the same. Smells so good, I can’t wait to get it out of the oven and try it.